I have been eagerly awaiting The Burning Sky for months. I am a huge fan of high fantasy and this book sounded absolutely amazing. 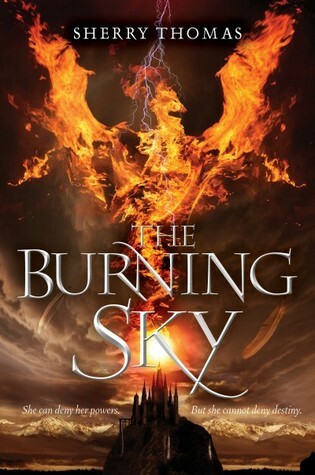 Now, The Burning Sky was not one of my favorites of this year, but I did enjoy it. I have no say, the first 30% of the book I was bored. I feel a little bad saying that because things did happen- there was magic, action, and adventure. However, I simply wasn't connecting with the book. I actually put it down for a few weeks and only picked it back up at the urging of Andye from Reading Teen (she is gaga over this book!) I have to say, when Iolanthe is changed into a bird- that seemed to be the turning point for me and the book. I found myself reading it urgently, needing to know what happened next. The book and I had finally "clicked". The Burning Sky really could easily slip into the Harry Potter world. I am not sure if this was done on purpose, or if it was simply something that happened as the book was being written- but I really enjoyed it. It was almost a grittier version of the HP world (the latter books instead of earlier). I enjoyed the magic use, the ability to "slip" into books. Oh yes, and the dragons. Iolanthe wasn't as completely developed as I would have liked. I did have some issues connecting with her, mostly because I didn't get much about her past in the book. I enjoyed learning about Titus and found his character extremely captivating. I am glad this is the first in a trilogy- I found myself wanting to know more and I would have been incredibly disappointed if this would have been a stand alone. I was a bit apprehensive about this book because I'm not a big fan of the genre, but the imagery of the main character turning into a bird makes my eyes pop out. That is so cool. I'm glad you enjoyed it. Definitely putting this book on my TBR list. I have been eagerly anticipating this book, but I have to say I am worried. I will still read it, but I need to bring my hopes down so that I am not too disappointed!